McDonald’s is known for their Big Mac sandwich all the world around. 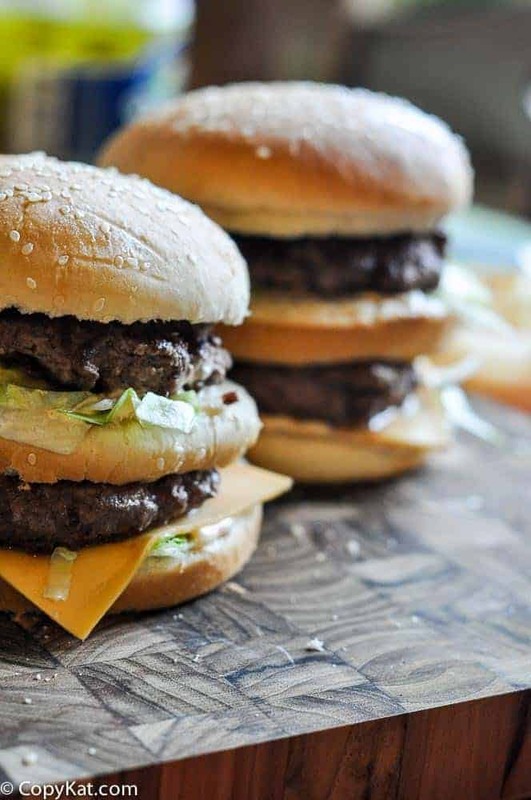 Now you can create your own homemade Big Mac recipe. The Big Mac sandwich is known for its two hamburger patties American cheese, “special sauce” (a variant of Thousand Island dressing), iceberg lettuce, pickles, and onions, served in a three-part sesame seed bun. Now you can make this classic recipe at home. The special sauce is really just a form of thousand island dressing. It isn’t made in the stores anymore. It now comes in an air tight container that gets squirted out like you would a chaulking gun. I will give you my person version of their “special sauce”. It is a fairly close approximation of the sauce. One thing I really like about making a copy cat recipe for McDonald’s is that you can add more beef if you like. 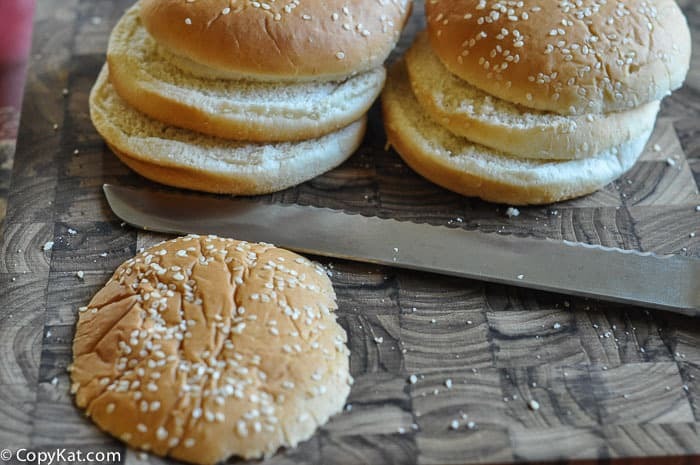 For this recipe I am going to use a package of hamburger buns but we are going to use some of the buns as the middle. So if you use a package of 8 hamburger buns you can get about five of your own homemade Big Macs. What I like to do is cut the top off of the top bun to make it even, when you do this you can easily turn it into the middle portion of the Big Mac. You can see this is how you can easily make your own Big Mac buns. , so this way you know exactly what you are eating. I personally love the ideas of some fast food items, but sometimes I like to try to make it a little healthier if I can. I hope you enjoy my version of the McDonald’s Big Mac. Did you love this? Make you own McDonald’s Quarter Pounder. The Homemade Big Mac tastes even better when you make this one at home. <a href="https://copykat.com/mcdonalds-secret-sauce/" title="McDonald’s Secret Sauce">"special sauce"
In a bowl combine ground chuck and salt and pepper. Shape meat into 10 meat patties. Shape patties somewhat thin. Set a griddle to 350 degrees. Place meat on the griddle and cook for 3 to 4 minutes. Season with a sprinkle of salt and pepper. Flip burgers and cook for an addition 3 to 4 minutes on each side, or until juices from the meat run clear. 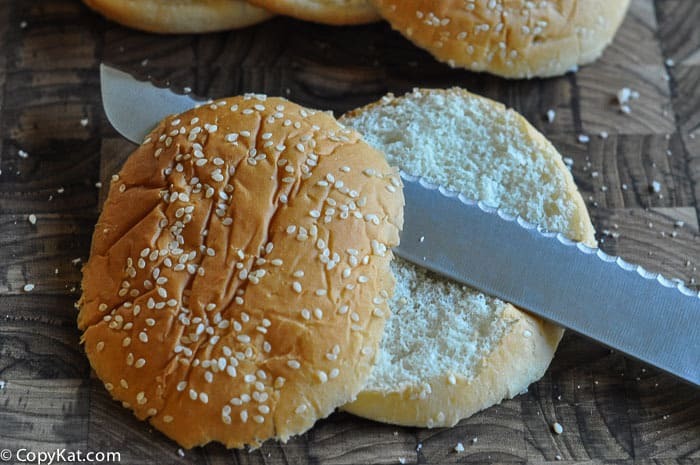 Spread softened butter on cut sides of bun and place on griddle until the bread begins to brown. Flip the middle bun and allow to toast on the both sides. Build the burger by starting at the bottom. The bottom bun, Big Mac sauce, onions, lettuce, cheese, hamburger patty, and the middle bun. Spread the Big Mac sauce, onion, lettuce, hamburger patty, two or three pickle slices, and finally the top bun. Found this site and I LOVE your copycats. Keep doing what you do. I know you have lots of devoted followers! Just found this recipe. Will definitely try it as my family loves hamburgers! Just one note – Lettuce is not listed on the ingredient list. Thanks for your recipes -so glad I found you! Love the suggestions and I am going to make this asap. The Big Mac has always been a favorite and that is why this is an extra special recipe. The trouble I have with the Big Mac, they don’t use enough meat, they should be made with at least a 1/3 pound burger, with all the stuff and bun on them you can’t taste the burger. I loved Taco John’s too. I miss some of the old favorites as well. It is a type of relish, it is sweet with a touch of spice to it. I love Big Macs and french fries and they are from McDonald’s which does have those very cool and modern PlayPlaces and that is going back to its classic 90s way. Wow stuff to make homemade big macs. I was a cook at McDonald’s during the time the Big Mac was introduced and you are very close to how we prepared the sandwich when it was initially rolled out nationwide. The use of ground chuck is spot on in that McDonald’s used ground beef that was free from additives at that time and not like the “pink slime” induced beef that is in use today across the industry. The patties were frozen and weighed one tenth of a pound and were placed on the grill in this state. The one change I would add is the searing process that McDonald’s utilized in pressing down hard on the patties at the 30 seconds mark after placing them on the grill. This created a crust on the face of the burger and also prevented loss of moisture from the meat. This is the only time you should ever press down on a burger patty. As another poster stated, we did utilize re-hydrated dried onions that were soaked at the start of the day. These were actually placed on the hamburger patty after turning and allowed to cook the flavor into the meat along with a good shake of both salt and pepper. You also mentioned the toasting of the bun which was a critical step in making sure the sauce did not soak into the bun. McDonald’s had a special toaster manufactured to toast both sides of the middle bun while also toasting one side of the top and bottom. Unfortunately, McDonald’s quit toasting their buns over a decade ago and the quality of their sandwiches has suffered. Thanks for posting these types of recipes as they allow our children and grandchildren to experience the exact types of food that we remember from our childhood prior to the big corporate takeovers of fast food that occurred in the 80’s and 90’s. I for one would love to see the same type of recipes from other fast food chains as the youngsters today have no idea how much better and higher quality the food of the 50’s, 60’s, 70’s were compared to today. Thank you for your detailed response. I will have to try making it with the dehydrated onions. Often I know fast food can be good, I think it often intends to be better than it really is. We were told the meat was a mixture of chuck and round with a fat content of 16.9%-18.2%. Yes, they were a 10-1 patty 1.6 ounces each and we put 7 pieces of dehydrated onion on each patty. Well most of us did so we didn’t get yelled at. 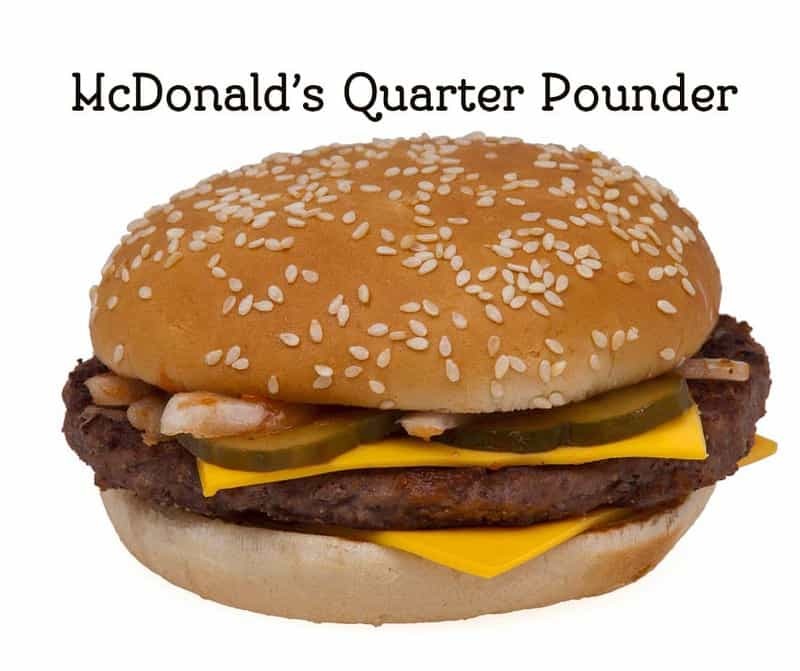 The meat of the quarter pounder was cooked for 4.5 minutes and the 10-1 patty for 2.0 minutes total. We did put a weight on the meat to keep them from cupping. McDs bought out all the potatoes in one region of Idaho where the potatoes had the greatest solids of any potato in the U.S. so good luck in copying those. The bun was higher in sugar than most store-bought buns but they were made by Rainbo and I got the rainbo man to sell me a tray of them once when I was in a grocery store. It is like a thousand island salad dressing. Use the hyperlink in the article. Sounds good, but have to laugh at “cooking from scratch is healthier”! Great suggestion, I personally love the dehydrated onions, I think you always get a consistent flavor when you use them.